Where do you store your kit at home? 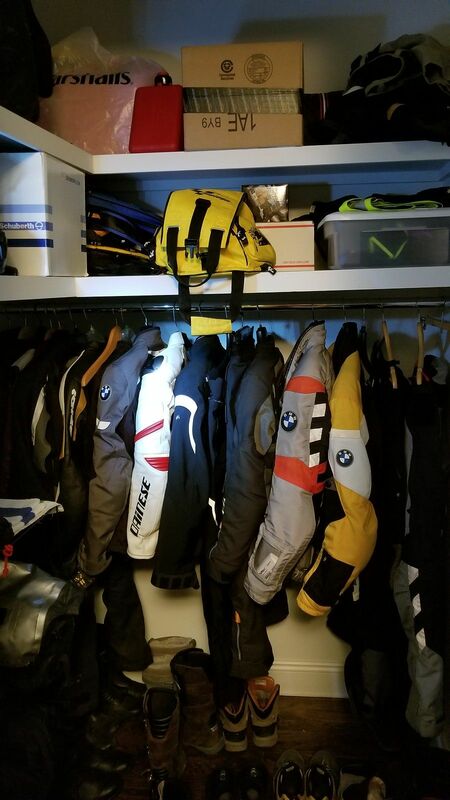 Re: Where do you store your kit at home? My wife stopped complaining about stuff years ago and I think pretty much ignores me now. However, every once in a while I can tell she gets irritated. I’ll go to find something and ask her where it moved to. She will often tell me she moved and out it someplace where she would remember but oddly she cannot at the time. I’ll invariably spend hours or days even searching the house. If (when) I do find it, it’ll be in the most obscure place one would ever think to look. That’s pretty much my wife’s way of reminding me how little I control the inner workings of the household! Fortunately she agrees to let me build a new garage. Should be up by the years end! It does prompt the question "how much kit is to much?" There is no such thing as "too many jackets." Therefore there is no such thing as "too many kits." Between the missus and myself, we have 6 "kits" each (so, not everything there is mine. it's half an half) I would say "the same number as your significant other's kits is a safe number and if you go above that, then that's too much." Ha, that looks very familiar! Store my kit? I just throw it away at the end of the ride and buy new stuff when I go on the next one! That way I'm always fresh and clean, and I've never outgrown anything. I don't really have the space (or have the space in the right place, really) to store my stuff properly. My 1-car garage is uninsulated and unheated, and barely fits my tools, air compressor, power equipment and 2 motorcycles (it was worse when I had 3 of them) with a car inside. Plus, the garage gets the occasional mouse, and I would be super pissed if one chewed holes in my gear. I keep my boots in my bedroom closet, my gear (and my fiance's gear) are hanging from the basement ceiling on a sturdy section of pipe bought for that purpose. 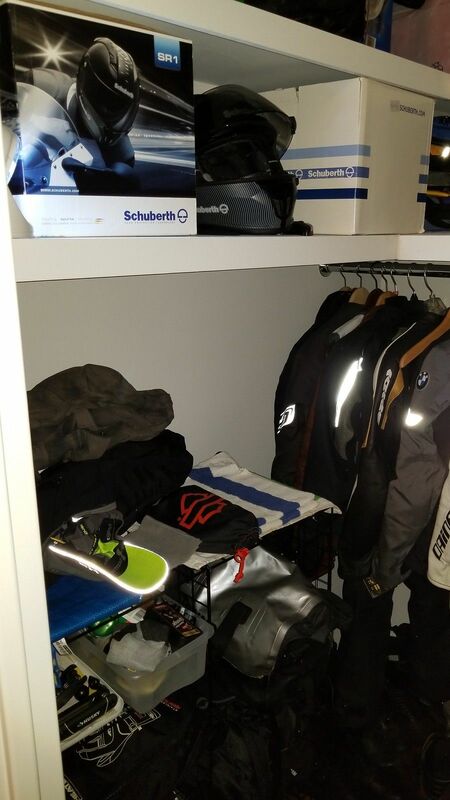 My gloves, rain gear, heated gear, various liners are kept in a small wheeled cabinet next to the shelving unit where I keep my helmets, base layers and tank bag. I have a self in the garage for my panniers. I don't want to meed the mouse than can chew through those.